Heat oven to 350°F. 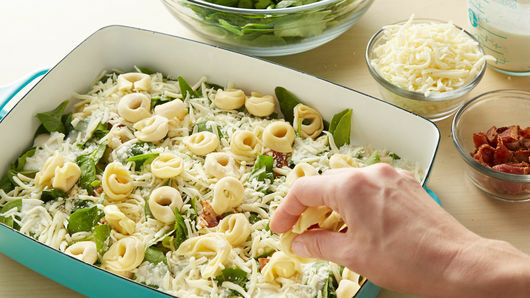 Spray bottom and sides of 13x9-inch (3-quart) glass baking dish generously with cooking spray. In medium bowl, mix Alfredo sauce and water. 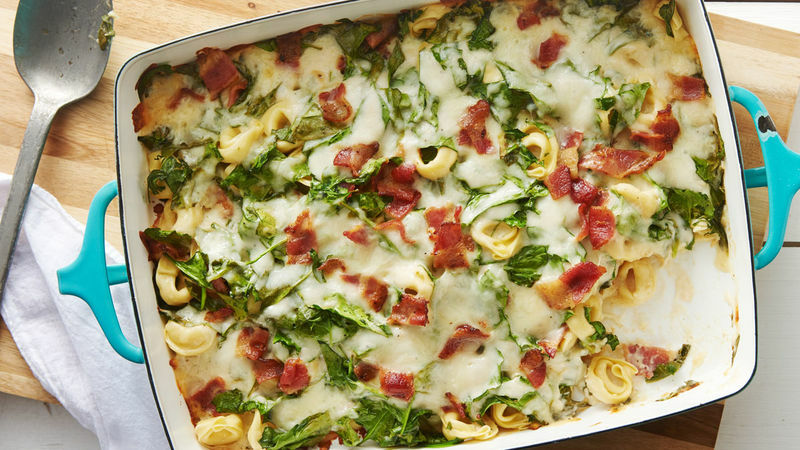 Arrange half of the frozen tortellini in single layer in baking dish; top with 1/4 cup of the bacon, half of the spinach, half of the Alfredo sauce mixture and 1 cup of the mozzarella cheese. Repeat layers. Top with remaining 2 tablespoons bacon. Spray one side foil with cooking spray and cover baking dish, sprayed side down. Bake 40 minutes. Remove foil; bake 10 to 15 minutes longer or until bubbly around edges and hot in center. Tortellini is sold in freezer section of the grocery store. Precooked bacon is sold in boxes in the meat section of the grocery store.